Color makes Katy LaReau weak in the knees. Katy has spent her adult life immersed in the world of craft, initially as a fused-glass artist. Her glass work used a vibrant signature color palette, its themes ranging from whimsical to modern. 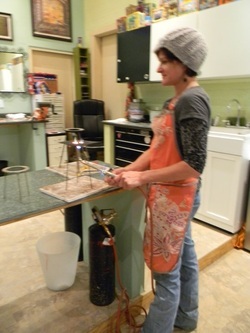 Recently she has made her first forays into the world of metalsmithing, specifically in jewelry and adornment. The addition of enamel to her metal work brings the possibilities of color, hearkening back to her vibrant glass work but, at the same time, entirely new. She is currently enameling simple metal shapes as jewelry components and assembling them on forged steel or with silver rivets. This work has an urban, contemporary look, but never looks manufactured. Katy is captivated by all things hand-made, from food to art, and carries out every step of her process herself. Most of her metal pieces are hammered to distort the shapes slightly, to create the look she calls "perfectly imperfect." One of Katy's goals as an artist and a human being is to continue to learn. She is taking a range of classes, learning from other artists and bringing those skills and perspectives to her craft.